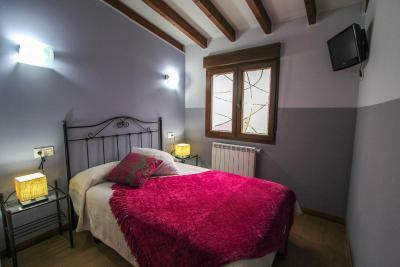 Lock in a great price for Alojamientos Fermín – rated 8.1 by recent guests! We arrived early and the cleaning lady let us check in as we sent the message to the hotel before hand. Also they let us store the luggages in their store room but we can only get them back from 5/30-7:30pm which is not quite flexible. The room is Very small, no kettle so we can't make coffee or tea. The boiler was out of order and I have to what's app the host to come to fix it at night. I can only take a shower nearly midnight. No English. Nobody at the reception even at the stated time. Expected that they can help to book the hiking activity as they mentioned in the booking.com but nobody can help. The cleaning lady asked us to go to the tourist information. I sent a message to the host for the information of hiking but no answer and only ask me when will come to check in. The only good thing is it is in a quiet area and facing the mountain and it is cheap. La ubicación, que tuviera parking y la tranquilidad del lugar. Un paraje para el disfrute y la desconeccion. La amabilidad de la recepcionista, fue muy simpática desde el primer momento y nos intentó ayudar con todo lo que le preguntamos. Alojamientos Fermín This rating is a reflection of how the property compares to the industry standard when it comes to price, facilities and services available. It's based on a self-evaluation by the property. Use this rating to help choose your stay! Alojamientos Fermin is a charming guest house with a rural setting in Cangas de Onís, 1,000 feet from the center. It features a terrace with beautiful views of the countryside. It offers rooms and apartments with rustic décor and views of the mountains. There is a flat-screen TV, heating and a private bathroom with free toiletries. A hairdryer can be requested at the reception. Alojamientos Fermin features a cafeteria. Guests can book several activities such as hiking or caving at the front desk. Free WiFi is available here. Set in a quiet area, Alojamientos Fermin is 500 feet from the public swimming pool and sports courts. The nearest beaches are located only 20 minutes’ drive away. Free parking is offered onsite. 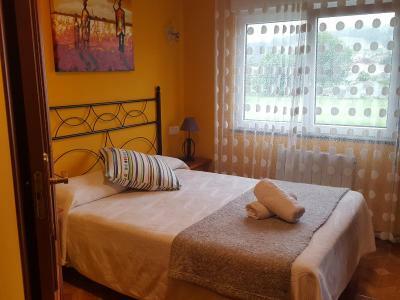 뀐 Located in the top-rated area in Cangas de Onís, this property has an excellent location score of 8.5! 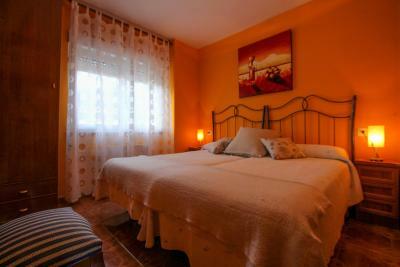 When would you like to stay at Alojamientos Fermín? This room with heating features mountain views. There is a flat-screen TV and a private bathroom with bath or shower and free toiletries. A hairdryer can be requested at the reception. Please note that towels, bed linen and cleaning services are included. 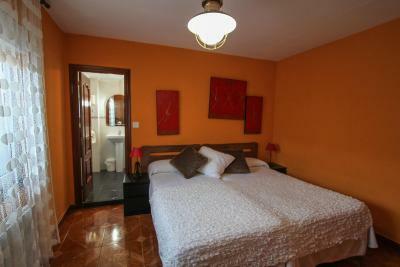 This apartment comes with a double room and a twin room with bed linen and towels. 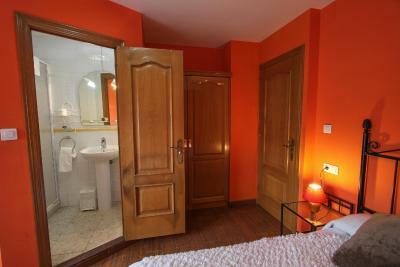 There is a bathroom and a fully equipped kitchen and a private terrace. Please note, for stays of more than 7 days, there is 1 free cleaning service, change of towels and bed linen. 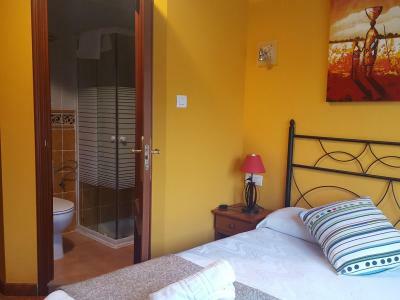 This room includes 1 double bed and a private bathroom with a shower. This studio features views of the street. It includes a fully-equipped kitchen and 1 bathroom with a hydromassage bath. Please note that this studio is only accessible through stairs. House Rules Alojamientos Fermín takes special requests – add in the next step! Alojamientos Fermín accepts these cards and reserves the right to temporarily hold an amount prior to arrival. Please note that reception is open until 20:30. Please notify your arrival time in advance. Please inform Alojamientos Fermín of your expected arrival time in advance. You can use the Special Requests box when booking, or contact the property directly using the contact details in your confirmation. Parking was just about off the street with no security. There was no one there to meet me and I had to phone. Staff was difficult, The room was up two flights and she would not assist with the luggage. She said that" this is a two star property and we do not assist with luggage".